The time something will take depends on how much time you allot to it. So if you give yourself a short deadline, you’ll be more productive and work faster. Conversely, if you give yourself a ton of time to do something, you’ll take longer to do it and think that it’s a bigger task. It’s one of the most useful concepts in productivity because if you use it intelligently, you can constrain the amount of time you have to do things and get them done faster. It’s not just time that obeys this rule, it’s EVERYTHING. Any time you’re drawing on a resource, the amount of it that you use will be affected by the amount you have at your disposal. Some people take hours to pack for a trip. They go through all their clothing to pick it out, find the right collection of shoes, and fill a massive suitcase. It’s a 26L Minaal bag that I picked up when I thought I was going to move to Argentina. 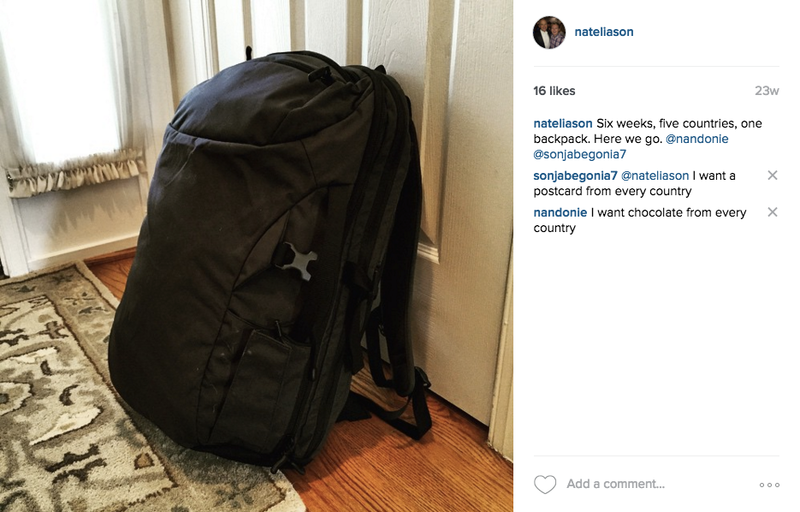 I traveled around Europe for 8 weeks with just that bag (and clothes in it, obviously). The only time I would ever use a suitcase now is if I literally needed a case for a suit (backpacks aren’t great about not wrinkling things). Packing is just one example, though. You can use the generalized law to affect your thinking with ANY resource. Instead of trying to budget or save money with what’s left over, immediately save or invest your money when you get it and then just use what’s leftover. You’ll spend what you have, so by reducing what you have up front you make sure you spend less. Restrict the supply (take home pay) and you’ll restrict the demand on it (how much you spend). You’ll fill your plate not based on how hungry you are, but based on how big the plate is. And the more on your plate, the more you’ll eat. Plate size, along with eating speed, are two of the biggest cultural reasons for America’s obesity issues. Restrict the supply (plate size) and you’ll restrict the demand on it (food picked up / eaten). Or you can just try not eating for five days. And so on for about half an hour. The solution? First, limit the amount of time you have to decide: “we’re going to pick something in less than five minutes.” Then, have one person pick a set of two or three places they’d like, and let the other person pick one from that set. That way you get around the decision paralysis. If you get a huge apartment or house, you’ll feel more obligated to fill it. By deliberating constricting the amount of space you have, you can make sure that you only buy stuff you really need and want, instead of just picking things up because you don’t want to be bugged by the emptiness. Conversely, if you make an effort to downsize, the amount of space you feel like you need will decrease as well. Similar to dieting, but if you want to reduce the amount that you drink at bars and such, just order smaller drinks. You’ll sip them slower since it seems like there’s less, and be less likely to wake up with a massive hangover. Any area where you have access to a resource, you’ll use more of it if you give yourself more of it. If you want to get more control over anything (time, space, money, etc.) all you have to do is reduce your supply of it.